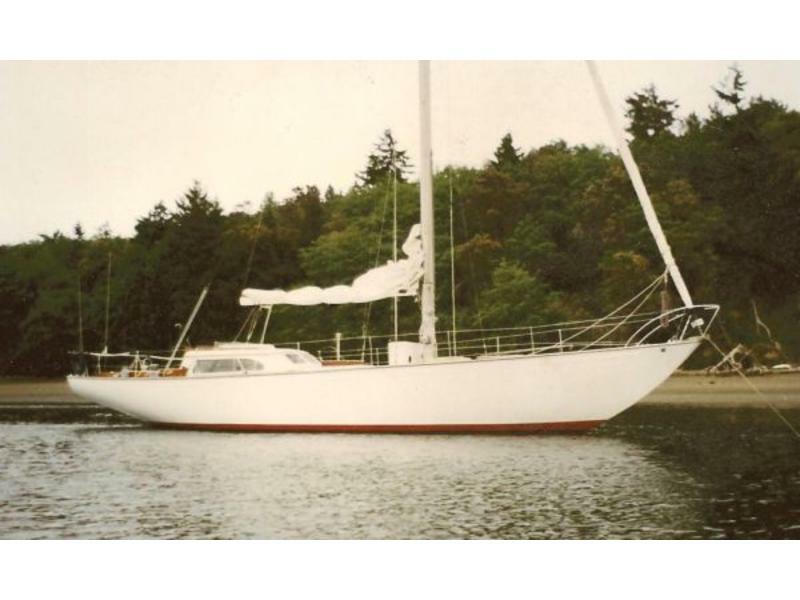 Minerva is a Bill Tripp-Designed Fiberglass Columbia 50. The Columbia 50’s were arguably the best boats to come out of the Columbia factory. The flush decks, graceful sheer and long overhangs make these classic yachts very distinctive and the Columbia 50′ was one of the first fiberglass boats to complete a circumnavigation. 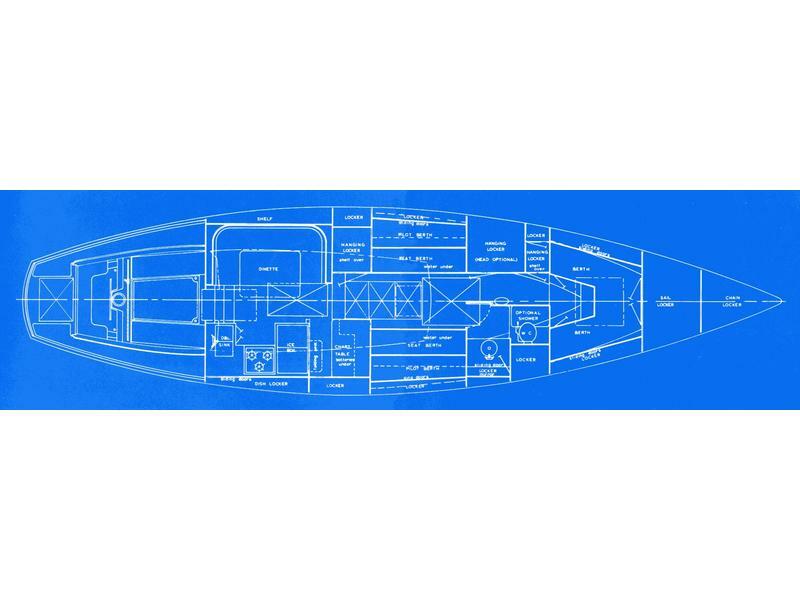 Minerva was hull #36 with a 12′ beam, LOA of 50′, LWL of 33.25′, 6’7″ draft, 62′ bridge clearance, and a displacement of 32,000 lbs. Launched in 1968, she was originally powered by a 70hp Universal engine that has since been replaced (several times over and most recently in 1990) by a diesel MP-70 Isuzu 4JB1PW AE/13 and Velvet Drive Marine Transmission. Minerva had a racing history and raced many times from California to Hawaii. She has a reduced length boom to maximize her handicapped racing performance and during one race was dismasted (many years ago). 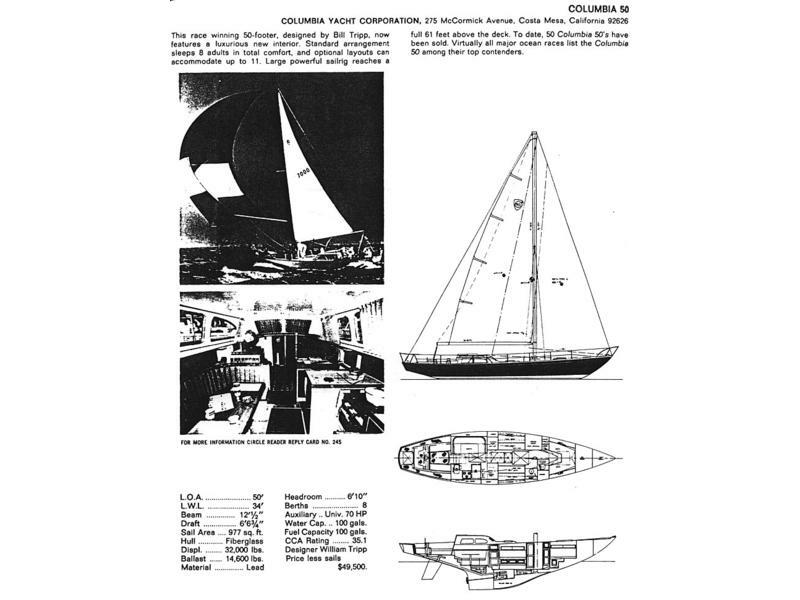 According to the builders, the Columbia 50 was the largest production fiberglass sailing yacht in the country available in the early part of 1966. She is said to be big enough to be comfortable, fast enough to win major ocean races and yet not too big to be owner maintained. She is of semi-light displacement form with a minimum of wetted surface, a high ballast-displacement ratio, flush deck and a divided cockpit. The standard layout includes an owner’s stateroom with a private head and stall shower, spacious main salon with a convertible dinette and galley, a large chart table and oilskin locker. Minerva has been updated to convert the owner’s cabin into a large interior space with 4 side berths. The head in the main cabin was removed in favor of storage space and a water heater for the shower. The head and shower for the owner’s cabin is now the main head and shower for the boat. The oilskin locker was replaced with a fuse panel and she now has AC/DC power, a refrigerator/freezer combo, GPS, and hot/cold pressure water. Minerva is equipped to sleep up to 8 (V berth, 4 side berths, convertible dining table) with double stainless sinks, hot and cold pressure water, a manual sea water sink pump, a SeaWard Princess 3 burner propane gimbaled stove with oven and LP gas controller and a large 9 cubic foot ice chest converted to a refrigerator/freezer combo via several NovaKool 12V cold plates. She also has a Xantrex ProSine 2.0 charger/inverter, several new D-8 batteries and a series 27 battery (batteries new 7/09), a Garmin GPS Map 215, AIWA AM/FM/CD 45 watt stereo, an Isotemp basic 40 water heater (powered via a 120V heater coil at shore and by engine cooling water when away from shore), 2 X 50 gallons of primary water storage (100 gallons total), 20 gallon holding tank, macerator pump for off shore, a 60 gallon primary diesel tank and a 25 gallon secondary diesel tank. She has a Dickinson Newport cabin heater (including a 2 gallon gravity fed diesel tank) with a heat exchanger to keep the place warm (Hetex should be hard wired). She has a large lighted compass at the helm along with a depth sounder and windspeed indicator. Her Verizon Maxi VHF is in the cabin. She has deck anchors with jack lines and has been equipped with running back stays and a removable innerstay to provide extra support to her mast. She also carries a healthy supply of oversized one and two speed winches to effectively handle her lines. Minerva’s sail inventory includes a main, genoa, and jib, all with several years of life left in them. I keep a 10.5 foot Avon Inflatible and small outboard. In 2004 she got a new 24×18 3 blade bronze prop on a 1.5″ shaft. Her primary anchor is a 60 lb. Delta on 320′ of 3/8″ chain hoisted by a Simpson Lawrence 1500 windlass with a manual handle backup (I have 80′ of 3/4″ nylon line to add to this but this still needs to be spliced to the chain). Her backup anchor is on 330′ of rode (30′ of 3/8″ chain matched to 300′ of 3/4″ nylon line) and is also a 60 lb. delta. I also just bought a 40lb. Danforth to hang off the stern as a lunch hook. Inside the cabin she has Seth Thomas Clocks and Barometers along with a brass inclinometer. She also has a more modern wireless weather station and a gimbaled oil lamp to add to her 12V lighting system. 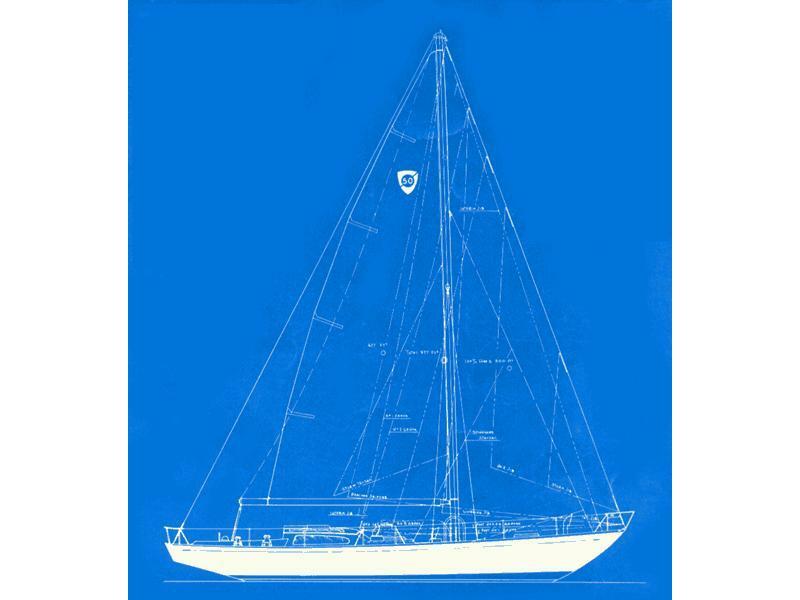 She has a roller furling head sail (predecessor to the Harkin MkIV) that is not currently installed and needs one piece of track (about 4 feet long and readily available). She has an ElectroSan that also needs to be installed. You can also find 2 fire extinguishers, winch handles, a MOB pole, lifesling, cockpit cushions, lifelines, fenders, portable swim ladder, smoke and CO alarm, flares, microwave, bilge high water alarm (not installed), propane alarm (not installed), whale manual bilge pump and powered bilge pump, Dickinson Sea-B-Que with stern mounting bracket, fishing pole holder, and life vests. She is even equipped with a backup tiller in case the wheel steering fails. She has a stainless steel hot and cold water vanity sink and a separately enclosed manual head and low-flow shower. Her wet locker has been converted into a storage area complete with stainless steel storage racks offering an impressive amount of space. Her cockpit now has a removable sunbrella cover to keep the sun and rain off when at anchor or shore.